A German expedition team made the first ascent of Pisang Peak and situated north of Manang valley in the famous Annapurna region. 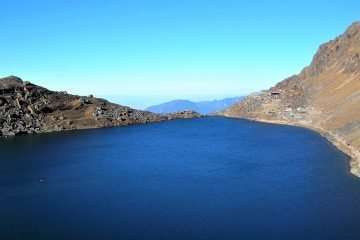 It is а way to highest passes of the world since it offers the full range of Himalayan scenery. So, the climbers require good physical condition and sportive. 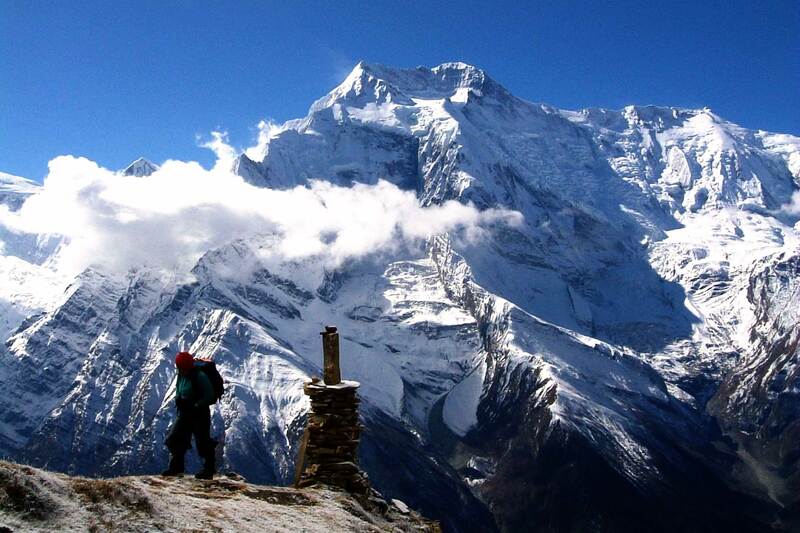 A famous Annapurna Circuit with Pisang Peak climbing is owing to а real taste of peak climbing in Nepal. 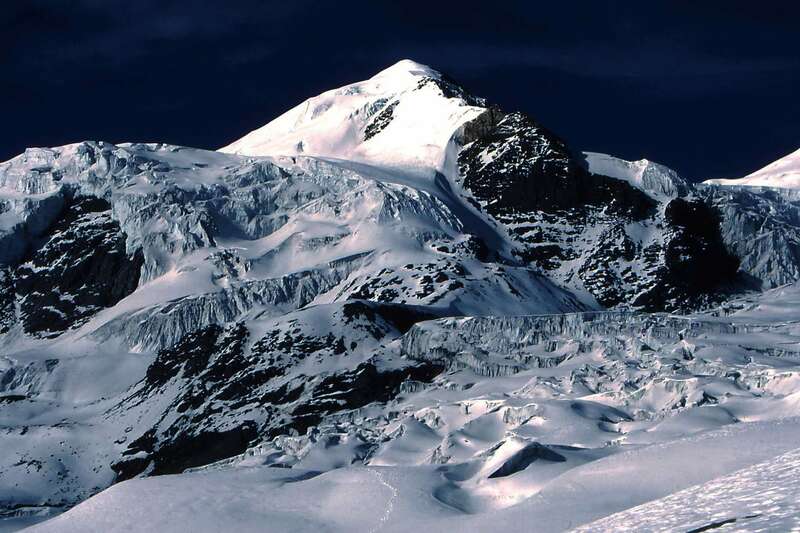 Pisang Peak especially climbs through the west ridge on the top of High Camp at 5200 meters. 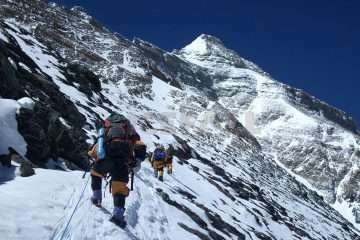 Even though, а shielded huge rock slabs make it challenging to rise whatever in wet or snowy condition and consider as technical climbing peak among the others trekking peaks of Nepal. Additionally, you may see very fabulous views the down valley of the Manang and the Annapurna Range from the summit of Pisang peak. Pisang Peak Climbing Trail begins as a classic trail of Annapurna Circuit Trek from Bensi Shahar. Then continues to walk along the Marshyangdi Valley River passing different medieval villages, forests, waterfalls and beautiful landscapes. The Annapurna region is most rich bio-diversities and has many trekking trails either shorter or longer and higher or lower regarding altitude. Besides that, you will get the opportunity to explore the hidden paradise of the medieval villages of Nar and Phu. 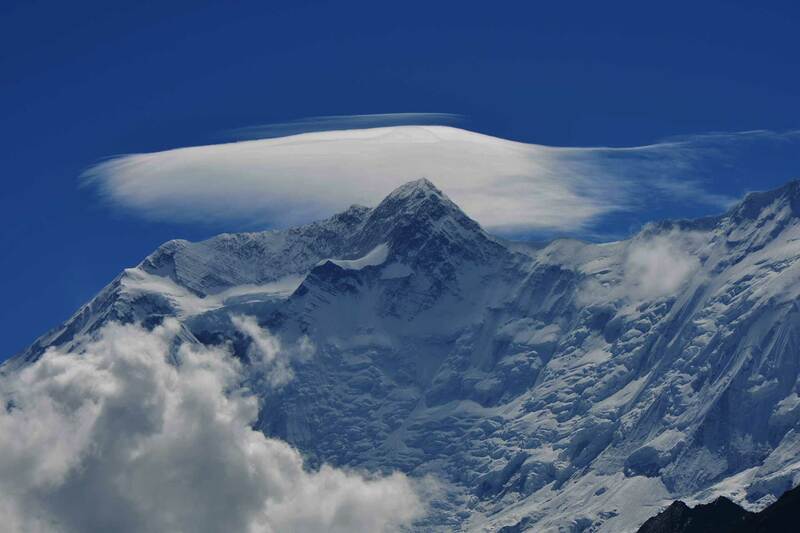 Similarly, a grand traverse of Kang – La offering 360 degrees of spectaculars scenery. In other hands, it helps to get proper acclimatization before leaving to make the summit of Pisang Peak. 12: Pisang Peak Base Camp to Manang (5-6 hours) 3,450 m.
13: Manang to Yak Kharka (3-4hours) 4,110m. 14: Yak Kharka to Thorong Pedi (3-4 hours) 4,600 m.
15: Thorong Phedi –Thorong la (5416 m)- Muktinath-(8-10 hours) 5,416 m.
Early morning, trek to Dharapani from Jagat. An easy walking trail along the road until Chamje and cross a suspension bridge, after it going up with bit zig-zag trails passing through the forests, bamboo and rhododendron to Taal. Then, easy walk along the river get Dharapani. Today, walking along steep forested landscapes to reach in Timang where you can enjoy a spectacular view of Mt. 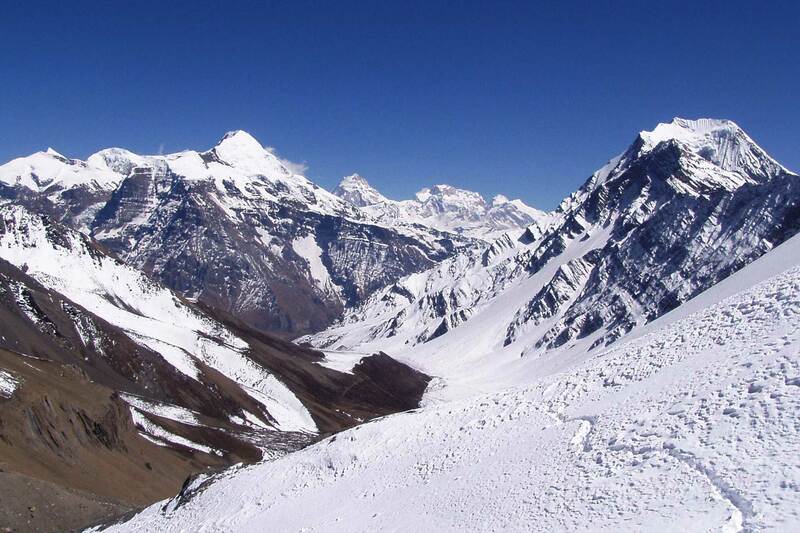 Manaslu and other major Himalayas like Annapurna II, Lamjung Himal, and Nathi Chuli. Night at the lodge. The rest day for acclimatization purpose. You have an opportunity to explore the village and monasteries. Enjoy the whole day with magnificent views of the Himalayas and check all the gears for climbing. Night at the lodge. Day 9: Upper Pisang to Pisang Peak Base Camp-(3-4hours) 4,380m. Today, Trek up to the Base Camp, a Steep path from upper Pisang to a Kharka. It is considered the best place to set up base camp. Night at the tent. Day 10: Trek to Pisang Peak High Camp-(3-4 hours) 5,400 m.
Other 3-4 hours walk to set up the high camp after ascending. Today we walked for 4 -5 hours and set up our high camp at the height of 5400 m. after climbing to a stand on the south-west ridge. In the November to March, there will be snow at the high camp. Night at Tent. Day 11: Summit to the Peak and back to Base Camp(7-9 hours) 6,091 m.
Today is having an important effect on the day of the summit on the peak. 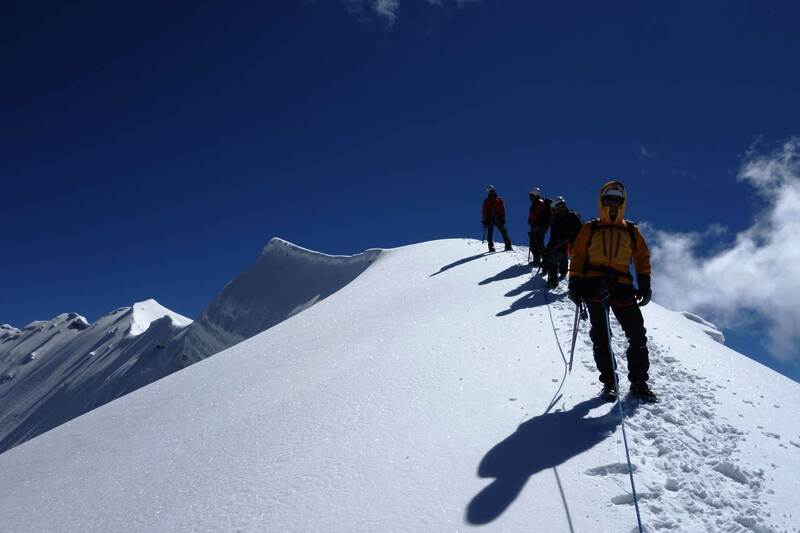 From the High Camp, The guide will generate the route up to the summit. The end of slop snow which is steeper and consider more technical to reach the summit of Pisang peak. After victorious on the summit. Your dream fulfills here and back to Base Camp. Night at the tent. Day 12: Pisang Peak Base Camp to Manang(5-6 hours) 3,450 m.
As usual in the morning, from Base Camp heading toward Manang passing through the Upper Pisang village where you can see a big difference between landscape and vegetation and remains breathtaking scenery of immense Himalayas. 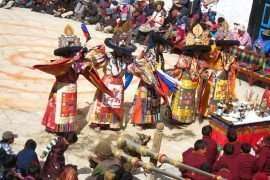 A classic trail of Annapurna Circuit Trek, Manang where you have an opportunity to observe customs, tradition, and lifestyle of Manangi people (an ethnic group of Nepal). Night at the lodge. Day 13: Manang to Yak Kharka (3-4hours) 4,110m. Glimpse of the Himalayan scenery approach in front of eyes. Gradually climb up to Gunsang. Easy walk to Yak kharka (a grazing place of Yak). Night in the lodge. Day 14: Yak Kharka to Thorong Pedi (3-4 hours) 4,600 m.
Easy walk from Yak Kharka to Thorong Phedi but small places and bustling settlement to cater the trekkers. 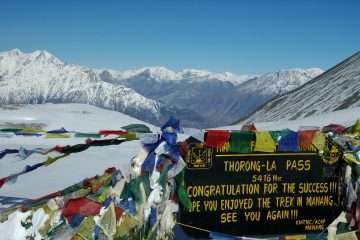 It is located lap of Thorong-La. Night in Lodge. Day 15: Thorong Phedi –Thorong la (5416 m)- Muktinath-(8-10 hours) 5,416 m.
It is important to early start to reach the Thorong-La pass because of long day walk and will be windy in the late morning. It is an incredible experience of life while on the pass. It may cause hindrance crossing this greatest pass of Thorong-La if it is covered by snow and altitude. The views from the trail and pass are outstanding Himalayan scenery. After the pass, it starts long descend to Muktinath. Muktinath is the popular religious site for both Buddhist and Hindu. Night at the lodge. It is an easy walk down to Kagbeni and highly recommends walking from Lubra valley to avoid dust caused by road. Super views of Tilicho peak, Nilgiri, and Dhaulagiri range from Lubra valley. Kagbeni, a gateway of upper Mustang you get an opportunity to explore the Tibetan culture and monasteries then continue walking along the Kali Gandaki River to Jomsom.